Droptext is a unique iPhone and iPad app from Kevin Smith that lets you edit text files you have on your Dropbox account from your iPhone and iPad. Now the cloud is not only a way to store files you edit on your MAC or PC but a way to edit your text files too. Would be great if the Dropbox app itself added this functionality, but for now you’ve got Droptext. On initial launch you enter your Dropbox login info and your files are shown to you. You can log out at any time. 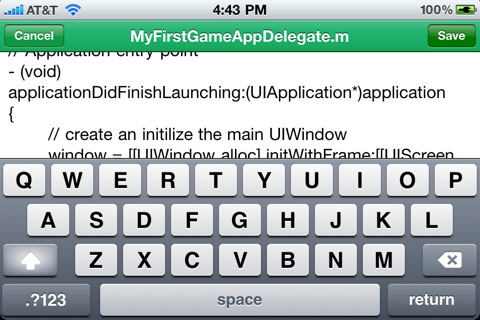 Droptext won’t let you edit anything but text files, but this doesn’t limit you to only .txt files. You can also edit other files that have a text mime type like .html .css .php .java or whatever other type of plain text files you might be storing on your Dropbox that you’d want to edit on the go. You can even edit bookmark files, sql database files and more. Files that you can edit on Droptext have an a little text paper icon next to them. 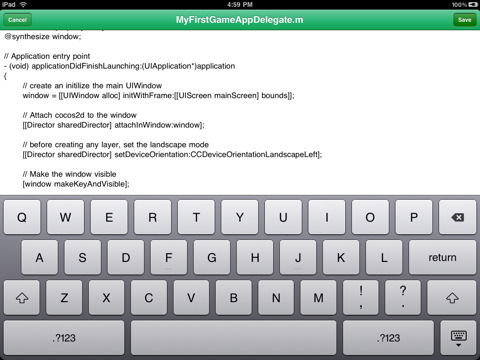 Tap any of those files and you’re presented with an edit screen and the virtual keyboard is pulled up. Larger files take a few seconds to load into Droptext for editing. Just edit and when you’re done tap the Save button. I tested editing a plain text file and it worked like a charm, and my changes appeared in Dropbox immediately. During my testing Droptext crashed at least 3 times. I’m not sure why this happened. Could be a bug or it could be some other issue. I was using an iPhone 4. This would have really made me upset if I had in fact had been editing a very large file and would have lost my changes. The Droptext universal binary works flawlessly on the iPad as well and the large screen makes for a great interface on the iPad. Overall a very good app that will be nice to have for those who want to directly edit their Dropbox files on the go. Good for editing todo lists and code files you keep on the Dropbox cloud. AppSafari review of Droptext was written by Joe Seifi on July 11th, 2010 and categorized under App Store, Developers, Files, iPad apps, Notes, Universal. Page viewed 4534 times, 1 so far today. Need help on using these apps? Please read the Help Page.